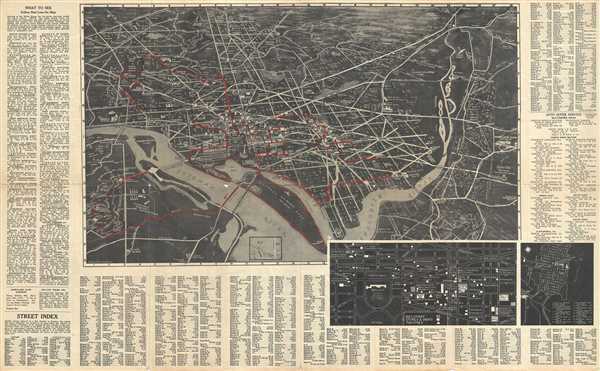 Unusual pictorial map of Washington D. C.
In and Out' Airvue Map and Guide of Washington. This is an interesting and unusual pictorial map of Washington D. C. issued by R.C. Traster and Son in 1934. The ‘In and Out’ map features a birds-eye view of the city with streets, various monuments, parks, and neighborhoods labeled. This view offers a fascinating snapshot of the nation's capitol looking northward from the Potomac River towards the National Capital Memorial Park and beyond. The map shows the capital and its vicinity in considerable detail. Streets, parks, rivers, bridges and important buildings and monuments are noted throughout. Surrounding the map are notes on 'what to see in Washington.' On the left-hand side of the map there is a list of landmarks and museums of interest, each with a brief description and address. On the right-hand side and along the bottom, is an in-depth city street index. The guide even offers a walking tour of Washington, urging you to 'follow the red line' on the map from point to point. Two smaller maps are also included near the bottom right. The verso offers a wealth of practical information for the tourist including ‘where to stay’, ‘where to go’, ‘where to dine’, ‘where to find’ and some interesting facts and the history of Washington. The map was copyrighted and issued by R.C. Traster and Sons in 1934. Very good. Minor wear and verso repair along original fold lines, including minor damage near center of map. Overall toning.